How are you all feeling after Easter? 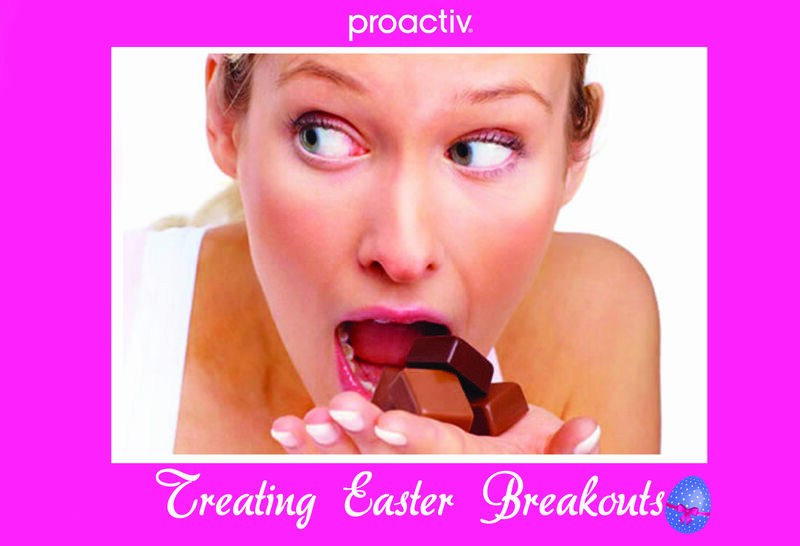 We are betting there have been a fair few chocolate blowouts over the Easter long weekend and we all know that for those of us who are unlucky, chocolate = break out. If you are one of the unlucky few who experience this then here are a few tips to help you get back on track! 1. Do a gentle cleanse - It’s a myth that you can get breakouts from dirty skin, there is a lot more to it than that. So, while it’s important to cleanse, do it gently or you can aggravate already delicate skin. The Proactiv Cleanser, formulated with smooth exfoliating beads can help to gently cleanse skin and remove impurities, whilst also helping to clear and prevent future breakouts..
2. Exfoliate - Removing the dead skin and pollutants from your skin will give it a chance to breathe and repair itself. But once again- be gentle on your skin! The Proactiv Skin Smoothing Exfoliator helps unclog your pores and clear your blemishes. It also contains glycolic acid to help balance out any redness or blotchiness that can appear after a choccy binge! 3. Keep your skin clear - When you have an acne outbreak it’s essential that we take the appropriate steps to help us back on our way to clear skin. Lay off the makeup if you can (even though you may want to cover up the acne spots) and make sure any moisturiser or sunscreen is oil free and non-comedogenic – this helps to keep your pores clear. Our Oil-free Moisturiser with SPF 15+ is light-weight with oil absorbing properties to help soak up any excess shine and will leave skin feeling hydrated, as your skin works to repair itself. 4. Eat well - Your diet can have a lot to do with how healthy your skin is. After bingeing on all that chocolate, your body needs lots of fresh, healthy food. You need fruit and veggies, essential fats and lean protein to help your skin clear up. 5. Drink alot of water - Nothing flushes out the system like water. Drink a lot to help remove the toxins from your body and give you lovely, glowing skin. Well, we hope this helps and you’ll be back to your best self in no time. Have a fantastic week!